Update 9/1 - These just dropped to $401 CAD roundtrip! toronto, yyz, flight deals, asia, east asia, taipei, taiwan, tpe, china, shanghai, pvg and united airlines. 12 Responses to "2-in-1 trip: Toronto to Shanghai, China *and* Taipei, Taiwan - $401 CAD roundtrip including taxes"
Got it for Jan, can't wait to visit Taiwan, Thanks!!!!! 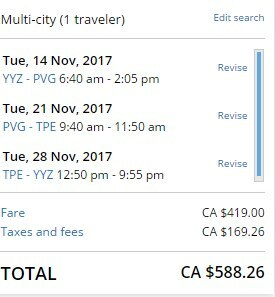 just booked, but not yet issued and charged by UNITED. It will take united up to 24 hours to confirm 2 partner flights included in the trip. Hopefully, the reservation can go through. Availability through to March 2018 at least. Booked two weeks trip in February 2018. 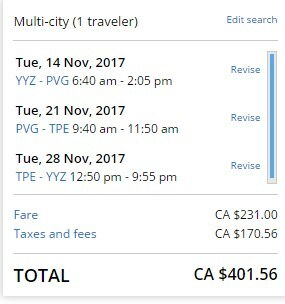 My finding is as long as your outbound flight (YYZ->PVG) falls on Tuesday and return flight (TPE->YYZ) on Tuesday as well, and the second leg (PVG->TPE) doesn't fall on weekend, your fare should be $402. Note February 16 is the Chinese New Year (Feb 15 being the eve) and usually the flight tickets to China are usually higher than usual due to high demand. Thanks Jack! I added some more example dates. The latest in 2018 they are available appears to be around the third week of March. I booked this for my mom who then called in for a meal request. The agent cancelled the ticket on her. Advise you don't contact united about the fare. United just cancelled my ticket, stating that it couldn't confirm seats with Junyao airlines. Bummer! Looks like we got the same issue - they can't issue a ticket. We're calling United to confirm. so Francis, did UA give you any alternatives? My ticket was cancelled after for than 48 hours. Called united 3 times. They hung up the phone everytime after I provided them with the booking reference. Still on the phone with UA - we're looking into alternatives. However, UA charged us on September 3rd for $4000 for changes we never made. It's fundamental fraud. We're looking to resolve this ASAP, and it appears that UA just overwrote our original reservations. I have same issue with Francis, call UA to arrange alternate solution and was confirmed by Agent that I can get flight with different airline on same dates and supposedly receive an email. I didn't get the email so I call UA again today, only to find out they reroute me to Beijing and then said the flight can not be booked. Now they are saying there is nothing they can do about it.